NASA’s FY2014 budget proposal includes a plan to robotically capture a small near-Earth asteroid and redirect it safely to a stable orbit in the Earth-moon system where astronauts can visit and explore it. Performing these elements for the proposed asteroid initiative integrates the best of NASA’s science, technology and human exploration capabilities and draws on the innovation of America’s brightest scientists and engineers. It uses current and developing capabilities to find both large asteroids that pose a hazard to Earth and small asteroids that could be candidates for the initiative, accelerates our technology development activities in high-powered solar electric propulsion and takes advantage of our hard work on the Space Launch System rocket and Orion spacecraft, helping to keep NASA on target to reach the President’s goal of sending humans to Mars in the 2030s. Through 16 missions in the National Oceanic and Atmospheric Administration’s underwater Aquarius Reef Base off the coast of Key Largo, Fla., aquanauts have tested techniques for human space exploration. These underwater tests have been built upon the experience gained by training astronauts in the Neutral Buoyancy Laboratory at NASA’s Johnson Space Center in Houston to assemble and maintain the space station. The NASA Extreme Environment Mission Operations (NEEMO) 15 and 16 missions in 2011 and 2012, respectively, simulated several challenges explorers will face when visiting an asteroid, including how to anchor to and move around the surface of a near-Earth object and how to collect samples of it. 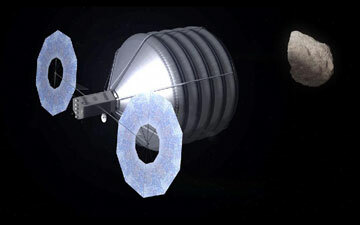 NASA also has simulated an asteroid mission as part of its 2012 Research and Technology Studies ground test at Johnson. During the simulation, a team evaluated how astronauts might do a spacewalk on an asteroid and accomplish other goals. While performing a spacewalk on a captured asteroid will involve different techniques than the activities performed during recent analog exercises, decisions made about ways to best sample an asteroid will be informed by the agency’s on-going concept development and past work. Scientific missions also have investigated the nature of asteroids to provide a glimpse of the origins of the solar system. From the Pioneer 10 spacecraft, which in 1972 was the first to venture into the Main Asteroid Belt, to the Dawn mission, which recently concluded its investigations of asteroid Vesta and is on its way to the dwarf planet Ceres, NASA’s forays help us understand the origins of the solar system and inform decisions about how to conduct missions to distant planetary bodies. Scientists both at NASA and across the world also continue to study asteroids to shed light on their unique characteristics. Previous articleAntarctic ice melt still in normal range?